The Ashley Nightstand with tool review is sponsored by The Home Depot. I have been compensated for my time and provided with product. All ideas and opinions are my own. This post contains some affiliate links for your convenience. Click here to read my full disclosure policy. 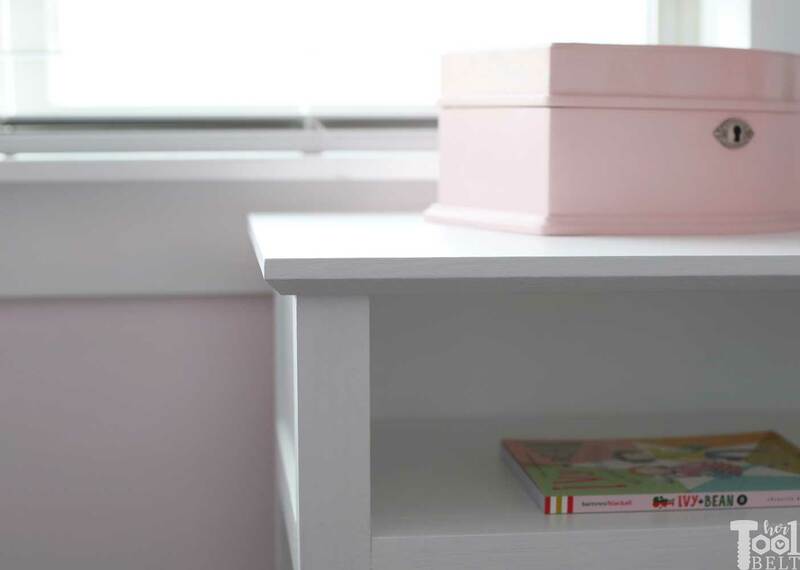 Note: Before building this nightstand, measure the height of the mattress top to the floor. That height – 3/4″ is the length you’ll want to make your legs. 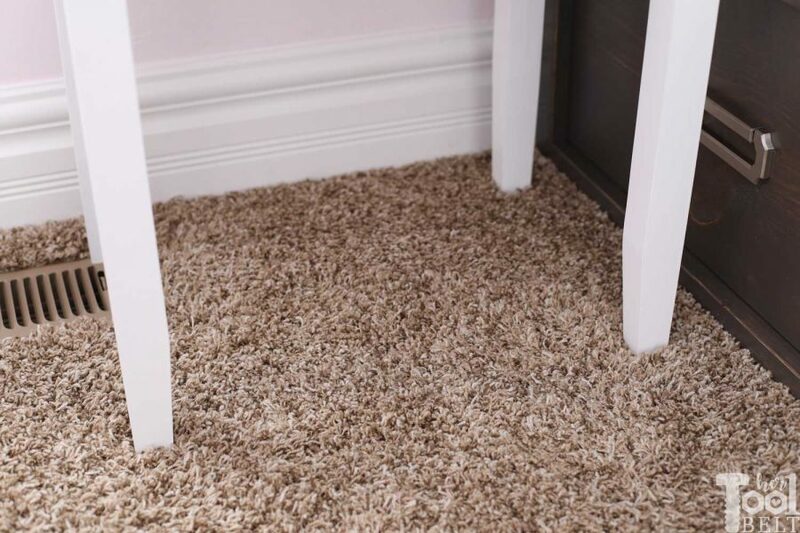 Ashley’s mattress top is 23″ from the floor, 23″ – 3/4″ = 22 1/4″ leg length. 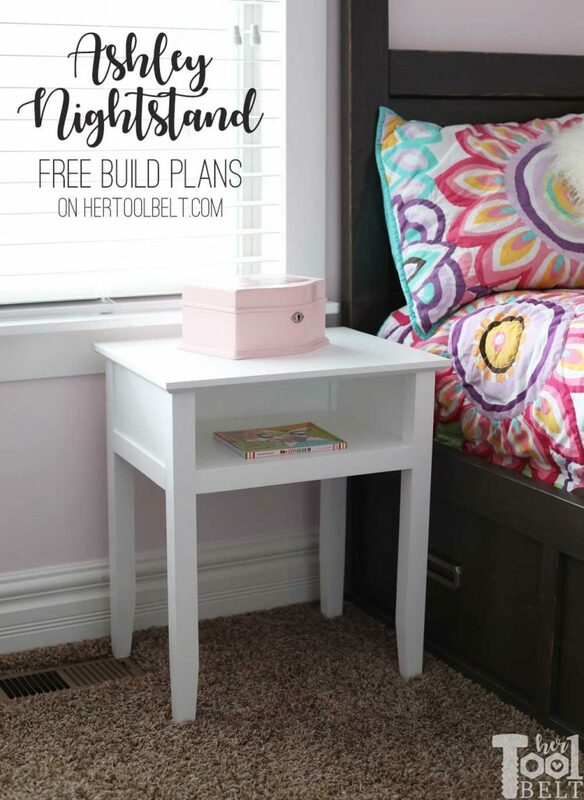 *Note – I’m reviewing these tools with this nightstand build and will share my thoughts on them throughout the build. Cut the boards according to the cut list. Cut the legs according to your mattress height as noted above. The widths of 1×6’s can vary between 5 1/4″ and 5 1/2″. 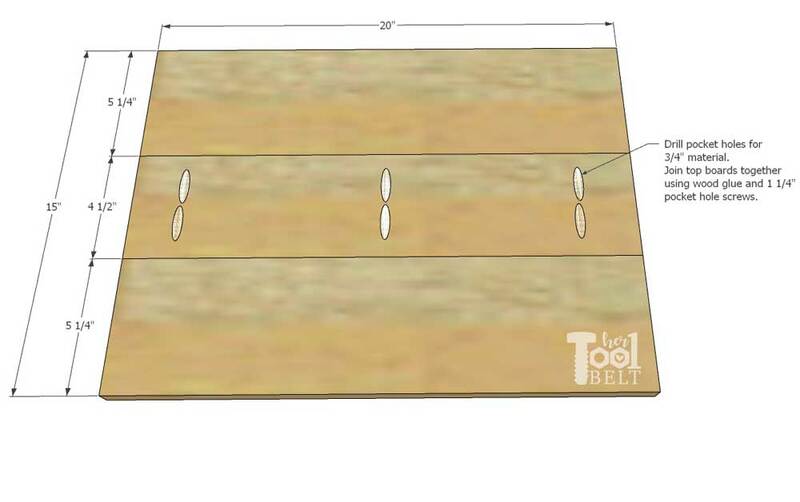 If your boards are 5 1/2″ wide, you can either keep them like that or trim down to 5 1/4″. The top and bottom pieces may have to be trimmed once joined together. If you want the taper detail on the bottom of the leg, you can use a jig saw and straight edge or circular saw and straight edge. Mark on the bottom of the legs up 3″ and over 1/4″, this is about 5 deg. Cut along that line. Rotate the leg 90 deg and do the same cut on another side. 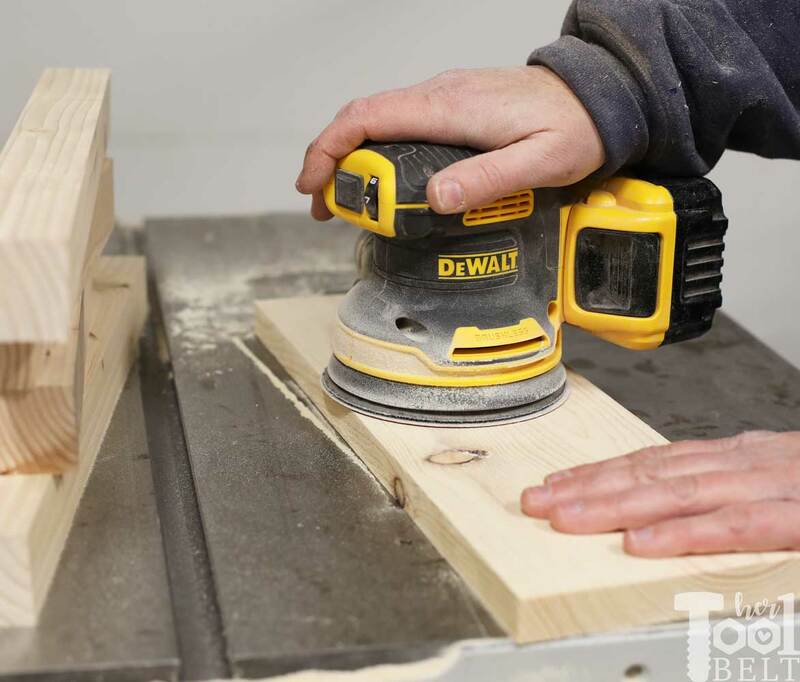 If using a jig saw, you may need to sand the taper smooth. 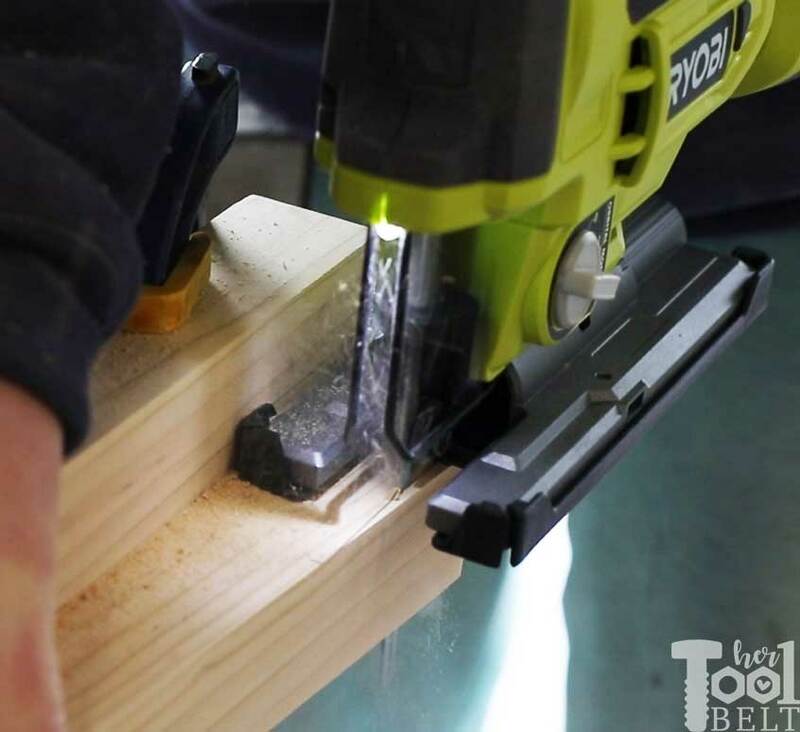 Using the Ryobi brushless jigsaw to cut the taper, one thing to beware of, the jigsaw blade will flare so it’s not the most perfect method. *The Ryobi brushless jigsaw has more bells and whistles than their regular 18v jigsaw. The efficient brushless motor gives you more run time on your battery. This jigsaw gives you the option to bevel the head, which is cool. It also has a lock on trigger and variable speed so you have adjustment for the material you’re cutting. 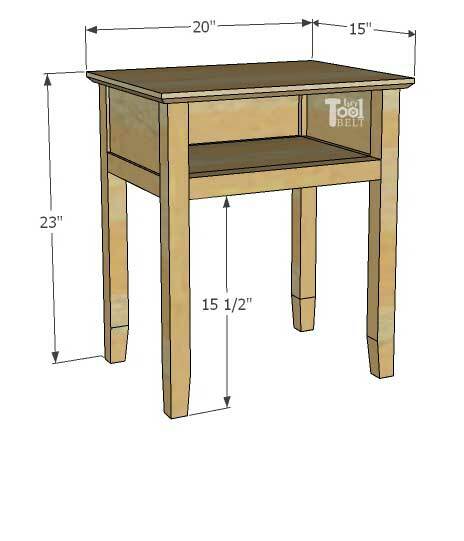 You may also want to sand all of the boards smooth before starting the nightstand assembly. *I’ve gone cordless on my random orbit sander and I LOVE it. I have been using the corded DeWALT variable speed sander for a few years and this new cordless sander feels very similar. One thing that catches me off guard is that it actually stops spinning as soon as you switch it off. In the side pieces (3/4″x5 1/4″x10 1/2″) and back piece (3/4″x5 1/4″x15 1/2″), drill pocket holes for 3/4″ material. Drill 2 or 3 pocket holes in each side. 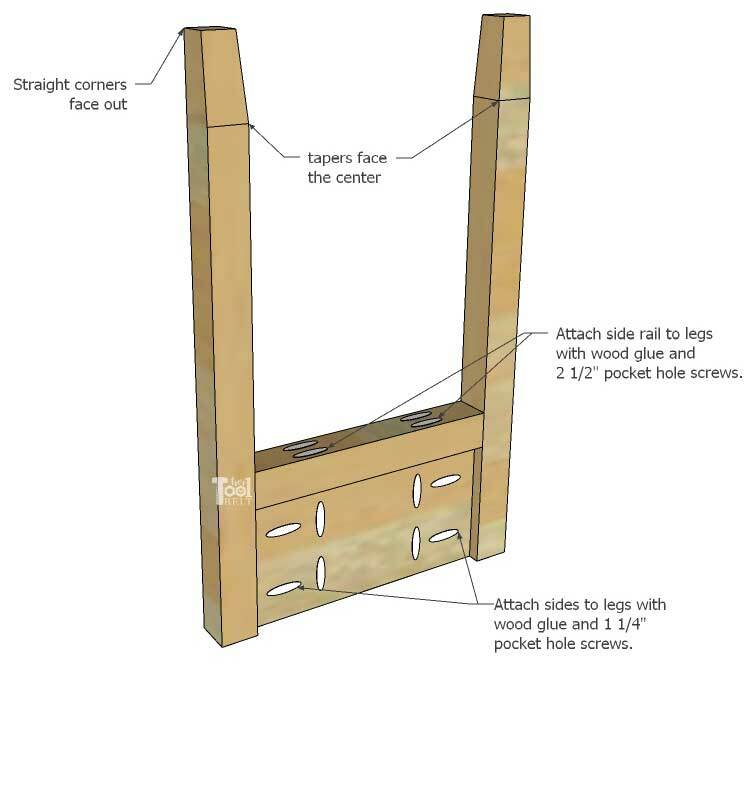 In the 2 side rail and 2 front/back rail pieces, drill pocket holes for 1 1/2″ material in each end. *I’m using the Milwaukee hammer drill/impact driver combo, and it is a solid set! 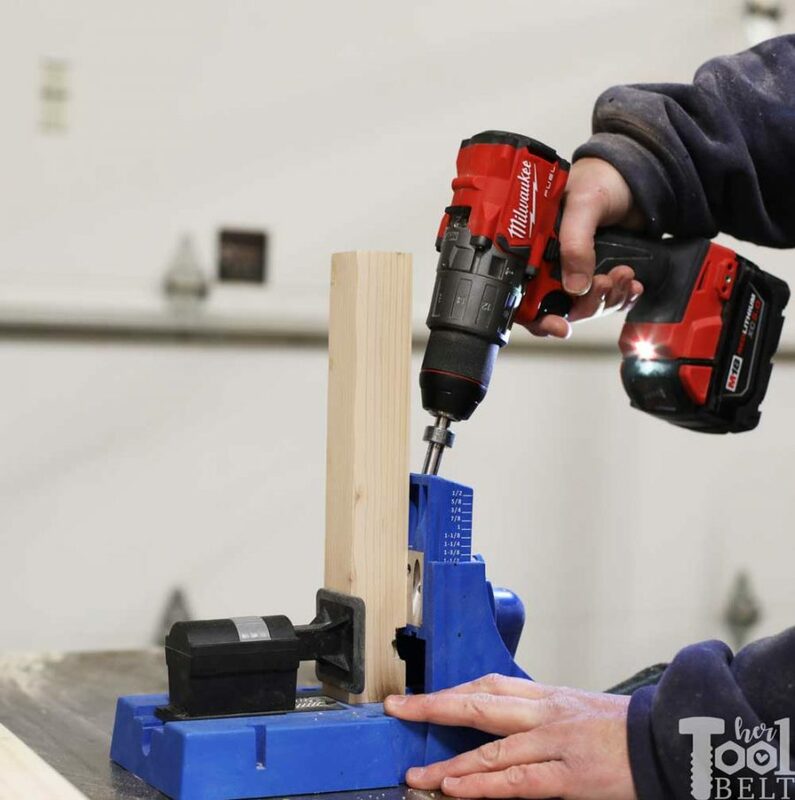 The hammer drill is as compact as a regular drill with tons of power. When doing pocket holes I like to keep the drill bit in the drill and the square bit in the impact driver. This helps me work faster and I like how the impact driver drives the pocket hole screws into the wood. 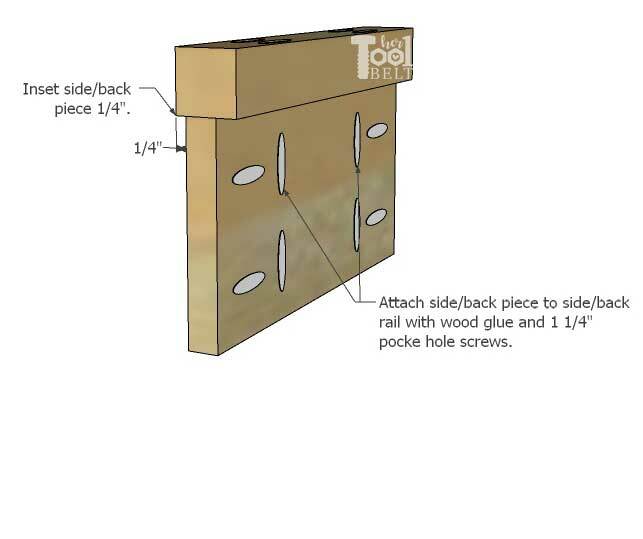 Inset a side piece 1/4″ on a side rail piece (1 1/2″x1 1/2″x10 1/2″), secure the side piece with wood glue and 1 1/4″ pocket hole screws. Repeat this process for the other side and back. Attach a leg to each end of the sides. 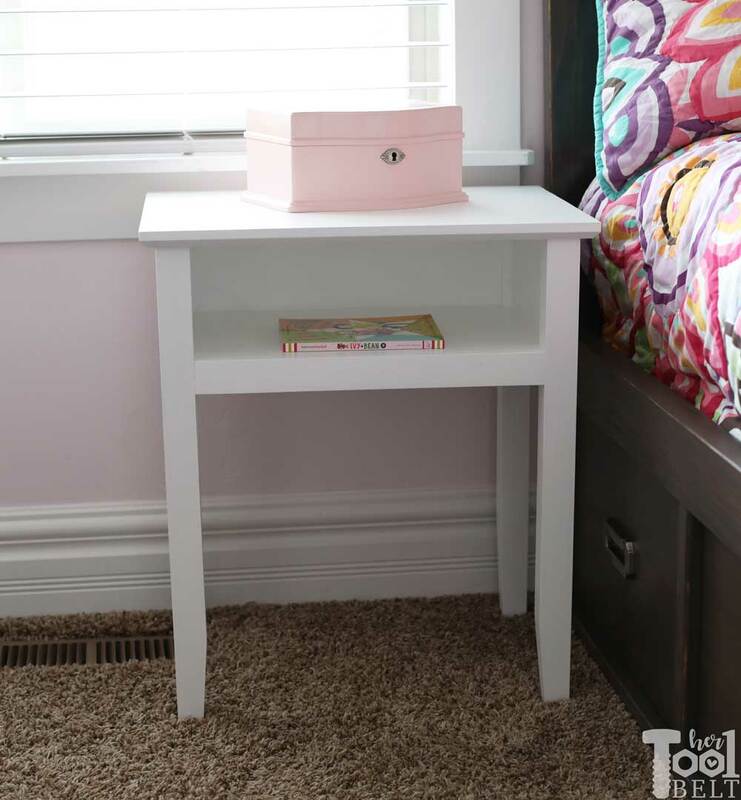 The tapered corner should face the center of the nightstand, the straight edge should face out. 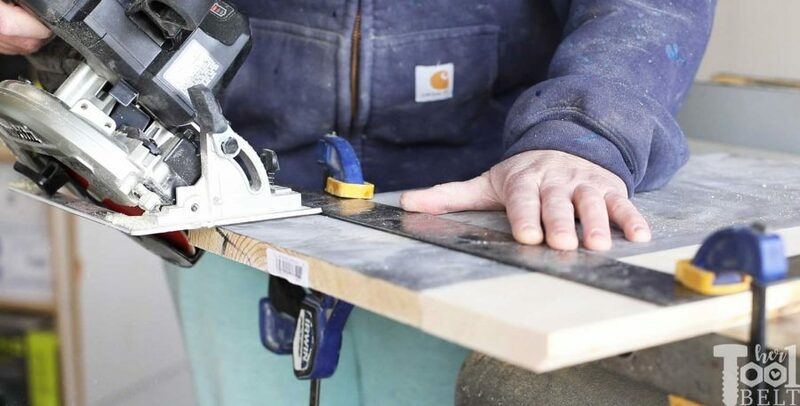 Make the side flush with the top of the legs and secure the sides to the legs with wood glue and 1 1/4″ pocket hole screws in the side pieces and 2 1/2″ pocket hole screws in the rail pieces. Secure the back piece/rail to the side pieces with wood glue and 1 1/4″ pocket hole screws thru the back and 2 1/2″ pocket hole screws thru the rail. 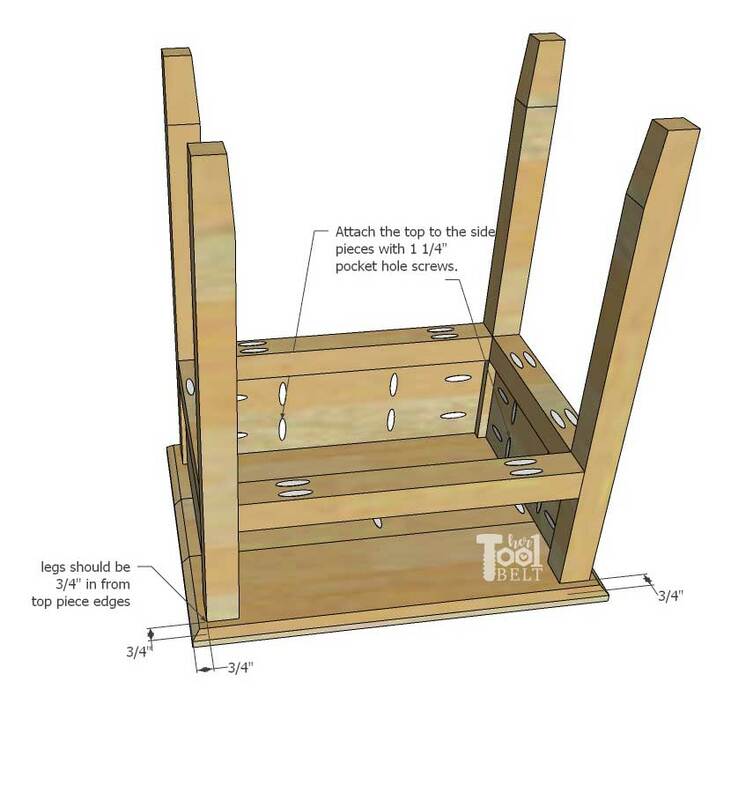 The back top should be flush with the top of the legs. Note: The top gets attached before the bottom (shelf), otherwise I wouldn’t have been able access the pocket holes in the nightstand. On the top assembly, you can either join the boards together, then trim it to size (15″ x 20″) or trim the boards to size then join them together. Whatever your preference. 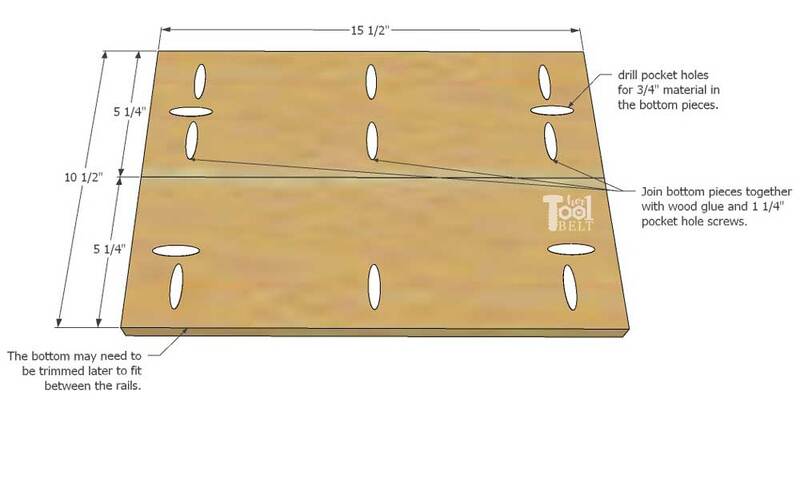 Drill pocket holes for 3/4″ material in the middle top board. Use wood glue and 1 1/4″ pocket hole screws to join the front and back boards to the middle board. Once the glue dried, I added a 45 deg chamfer to the underside of the top. This is optional, but I love the look. I used a 6 1/2″ circular saw and the Diablo 6 1/2″ Ultra finish blade. For this Makita 6 1/2″ saw, I set the angle at 45 deg and put a straight edge 3/4″ closer to the edge than I would have for a straight cut, this gave me a perfect chamfer and no router was needed! The Diablo blade made such a clean cut. Drill pocket holes in 4 sides of one of the bottom boards, and 3 sides of the other. 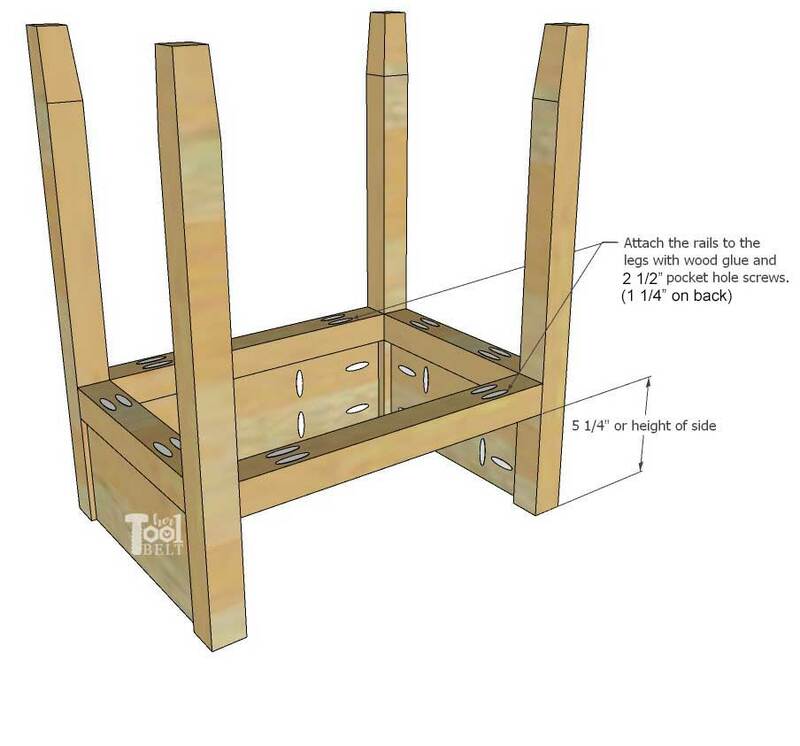 Use wood glue and 1 1/4″ pocket hole screws to join the bottom boards together. Turn the top and base upside down and center the base on the top. The legs should be about 3/4″ from the top sides. Attach the top to the sides/back with 1 1/4″ pocket hole screws. Fit the bottom/shelf into the rails, it may need to be trimmed to fit. Make the bottom/shelf flush with the tops of the rails. 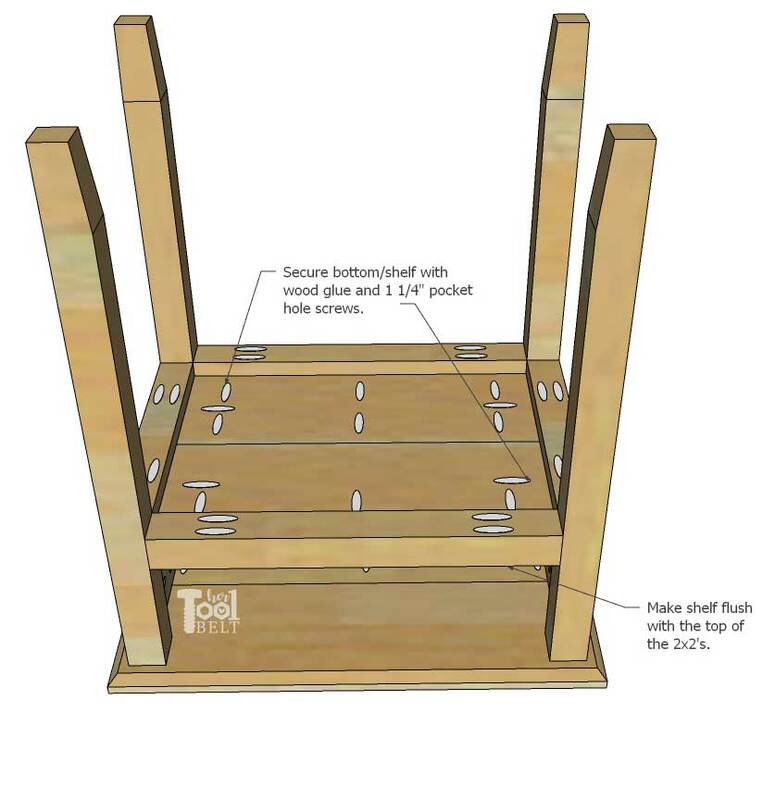 Secure with wood glue (optional) and 1 1/4″ pocket hole screws. Fill any showing pocket holes with wood filler or if painting, spackle. Let the filler dry. Sand the nightstand smooth, start with 80 grit sandpaper and work your way up to 220 grit. 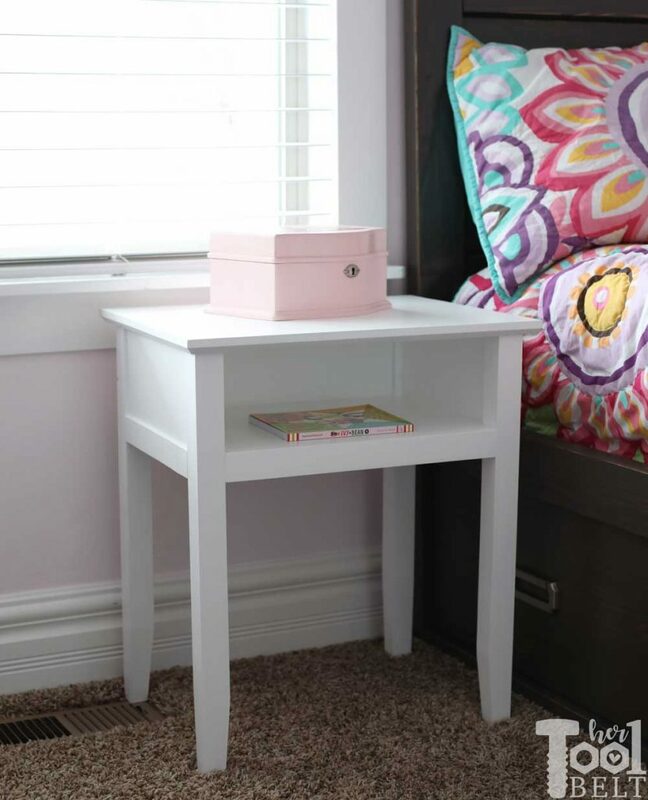 If painting, apply 1-2 coats of primer to the nightstand, let dry and lightly sand between coats. Apply your favorite color of paint. If staining, apply stain and let dry. Apply a top coat as desired. I love the extra details of the chamfer. The simple tapered legs add a nice detail too.